This campaign has been one of the most compelling for anyone that thinks Facebook won’t drive leads into your business. And yet, this case study, as you’ll soon find out, completely disapproves that myth. More importantly, it shows that Facebook is the dominant leader in traffic generation. With over 1 billion users on Facebook, I have no doubt that YOUR demographics (the prospects you’re looking to engage with) are Liking, Sharing and Commenting on pictures and videos. LET’S JUMP INTO THE MEAT OF THIS CASE STUDY! This campaign was focusing on seniors. Specifically, seniors 64 years old who were looking to enroll into Medicare insurance. The insurance company that hired me helped their senior clients through the enrollment process. You have to juggle all these moving pieces in order to get an effective CPL (cost per lead) for your company. Now typically, I like to have a full month to do all the testing of the ad copy, tweaking of the landing page and ensure we’re lowing CPL as much as possible before we really ramp up on ad spend. Unfortunately for this campaign, open enrollment into Medicare started in the middle of October and ended early December – which meant there was about a 6-week gap to get everything dialed in and performing, without blowing through an entire budget testing. Lucky for my client, I’ve been working with Facebook Ads for well over 4 years and have been doing internet marketing for over 10 years, so I know exactly what needs to be done quickly in order to create an effective campaign for lead generation. First step with any client is understanding what an effective cost per lead (CPL) looks like. After talking to my client, I found out they were spending about $60 per lead from their lead broker, which was a lead aggregator and resold these same leads 1-3 times. At $60 per lead (with their current lead aggregator), they closed 33% of them and were happy with those numbers. I could definitely have justified $100 per lead from my Facebook campaign, as the leads I was going to generate weren’t being resold. $25 per lead was my sweet spot to get them leads from our Facebook campaign. We hadn’t tested ANY TRAFFIC yet, so it’s hard to come up with a goal before-hand, but based off the reasearch I did, it seemed feasible. Below is the first campaign we ran. It lasted 8 days. Take-Aways: We spent $238.25 and generated 181 clicks on our ad. Our click-through-rate (CTR) was 0.7%. Our cost-per-click (CPC) was $1.11 per click on our ad. This was a good first step in understanding the demographics we were targeting. Below, you’ll find the first iteration of our Facebook ad. This ad was only featured in the Newsfeed section, as it generates the highest CTR (click-through-rate) over the sidebar ads, which have a lower CTR (generally). 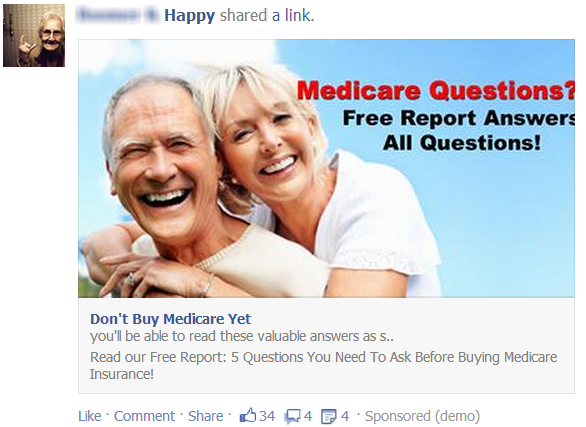 Take-Aways: We created an image of seniors with ad copy in the image. The ad was good enough to get 34 “Likes”, 4 Comments and 4 Shares from individuals who saw the ad. Below, is a screenshot from our Google Docs, of what we generated the client in the first 6 days of the campaign. Take-Aways: In 7 days, we generated 11 leads, with a total cost of $238.10. The cost per lead was $21.64. Now even though I hit my mark in generating leads for under $25 per lead, I knew we could do better than that. I wanted to get into the teens. The first campaign always is to test to see if our “Sweet CPL Spot” is feasible. If we can get the CPL close, within 5-10% of our goal CPL, we can typically lower it right into an effective CPL for our clients. Let’s jump into the campaign that took us into SUCCESS! Take-Aways: We spent $513.69 and generated 1,284 clicks on our new ad. Our click-through-rate (CTR) was 2.99%. Our cost-per-click (CPC) was $0.35 per click on our ad. As you can see… A HUGE IMPROVEMENT! I’ll be showing a side-by-side campaign of both campaigns further down in the case study to show you how well we outperformed our first campaign. Let’s jump into the revised ad. 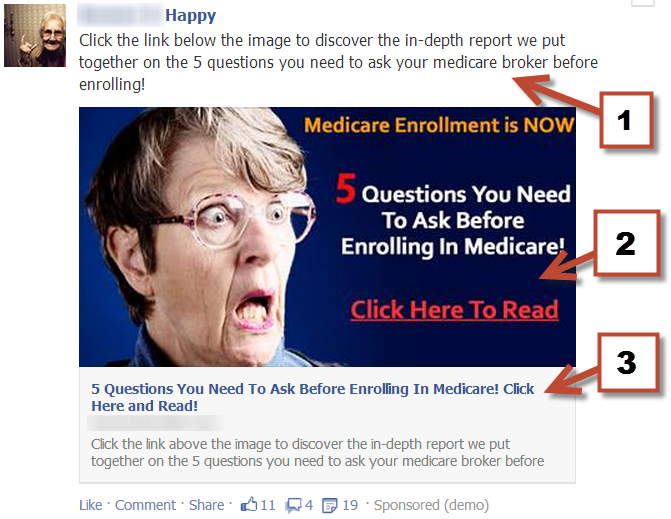 Take-Aways: We created an image of a shocked senior with ad copy in the image. The ad was good enough to get 11 “Likes”, 4 Comments and 19 Shares from individuals who saw the ad. Let’s go over what we did different and why this converted so much better. Numbers below represent the numbers with arrows in the Ad image above. #1) We put copy before the ad, letting the user know what to do and what they’ll be doing if they click. #2) The image was MUCH MORE COMPELLING! This goes into the psychology of people and what makes them tick. People are more interested in a “SHOCKED” person, rather than a happy couple. Additionally, the Ad Copy was clearer to read, had specific keywords that were relevant to the person and gave them a call-to-action (“Click Here To Read”). #3) We reiterated what we said above the image, along with having the clients URL (confidentially blurred) in the copy. We wanted to be absolutely clear what the prospect needed to do to get the report. With making all the changes outlined above, we EXPLODED the CTR (click-through-rate)! The first Ad was a dismal 0.7% CTR. Our second Ad CTR was 2.99%. Below, is a screenshot from our Google Docs, of what we generated this client in the next 12 days of the campaign. 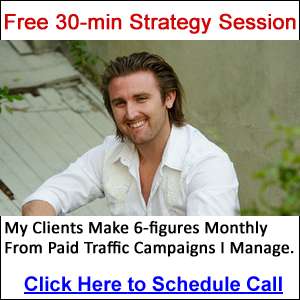 Take-Aways: In 12 days, we generated 28 leads, with a total cost of $513.69. The cost per lead was $18.34. Great results from our 2nd campaign. Unfortunately, we didn’t have enough time to do more for this client as Medicare enrollment closed. If we had more time, much like with our other clients who run “evergreen” business models, I have no doubt we would’ve dropped the CPL to $13-$15. Through this campaign, I was limited by a small budget and a short time schedule. Despite that though, I was still able to deliver the maximum amount of leads below our target CPL. The client was very satisfied with the results. Imagine for a moment what we could accomplish with a larger budget and a longer campaign that include thorough testing and targeting your exact demographics. This client’s Facebook campaign was only half of their overall lead generation campaign. The other half was generated through Google Adwords Display Network. Overall, we generated over 75 leads in total for this client, in only 18 days. This was a concrete success for the client.